It’s one tale that has perennially fascinated us, this tale of the two Shoguns of Ogun State who share a lot in common: Bashorun MKO Abiola, a national hero even in death, 25 years after winning an election but was denied being President of Nigeria, and Mike Adenuga, the younger business titan, taking the baton from the older man and rocketing into the orbit of business success. Yes, their commonalities have always excited us. By us, I mean the two inseparables whose friendship death couldn’t break: Mike Awoyinfa and Dimgba Igwe. My friend of blessed memory was the one who first wrote about these two business “Shoguns”—a title borrowed from James Clavell’s 1975 SHOGUN, A Novel of Japan. I searched everywhere to republish Dimgba’s original article but couldn’t find it. So I decided to write my own version, an ode to two great men we hold in very high esteem. Two men who more than any other in this world have impacted our lives with their generosity. All because they like the bond between a Yoruba man and an Igbo man which is unusual in a country primordially plagued with tribalism and ethnicity. Abiola and Adenuga. Two men we owe so much that we decided that the only way we can say “thank you” is writing books on them, as many as possible, because they have good stories to tell and are worthy of being studied and emulated. Starting with Abiola whom we helped to start Weekend Concord, a winning Saturday newspaper that carried our DNA with its human angle stories, a paper that created a paradigm shift in Nigerian journalism of the late ’80s and beyond, Abiola was the one who provided the money to publish our first book, the Art of Features, a journalism primer used in universities and journalism schools. Not only did he give us the seed capital, he took over as chief launcher and urging everyone to support our literary effort because “it is not easy to write a book.” When we went to collect our cheque, Abiola had a domestic accident and his right hand encased in a Plaster of Paris (POP) yet managed to sign the cheque. He could have said: “Come back when I am able to sign a cheque.” But he didn’t. That for me is my unforgettable Abiola moment. From Weekend Concord, we moved to start The Sun and lightning struck twice. We created another winning and profitable newspaper for the owner. We give Jehovah God all the glory! It was at The Sun we met Mike Adenuga whom we chose as our first “Sun Man of the Year” when I was MD and Dimgba my deputy. Adenuga from that time had stood by us like the Rock of Gibraltar. As our own way of showing gratitude, we have written a book on him which should be out in the next few months. It is so sad that my brother is not alive to see this new book which we started together but I had to complete. Sadness No.2 was the painful loss of the manuscript of the biography of Chief MKO Abiola and the June 12 saga written during the closure of our Concord newspaper group by the military government in those terrible times. We went about talking to all the main characters in the June 12 struggle from Abiola’s assassinated heroic wife Kudirat to Chief Gani Fawehinmi, another Nigerian departed national hero. We recorded their thoughts and the untold stories of June 12 for posterity. Unfortunately, when moving into our new abode, Dimgba misplaced the manuscript and the biography of Chief Dele Fajemirokun. Even the copy we gave to Chief Fajemirokun can’t be found. Losing a manuscript is like losing a child. Two children all gone. If we had written those books in the era of the Internet, we could have retrieved them easily. But in those days, there was nothing like that. Not even mobile phones which we take for granted today. In those days, Chief MKO Abiola was the chairman and chief executive of ITT, the leading telecommunications company of that bygone era when telephone was luxury just for the rich few, not for the poor masses. On his part, Mike Adenuga today has taken telephony to another level by creating a modern telecoms brand Glo, carrying the can-do spirit of Nigeria, singlehandedly starting from zero, not by a merger nor acquisition, but using his own wealth, talent, passion, teamwork, state-of-the-art technology and unstoppable, resolute spirit to build a network committed to being No.1 in Africa with its audacious transoceanic undersea cables and fibre network. In 1993, Abiola surprisingly veered into politics, winning hands down an election that changed this nation, but was wickedly cancelled in a clear case of political theft and corruption, leaving us to wonder what Nigeria would have been under President Abiola. Just the news of Abiola’s victory and prices dropped like mercury barometer. 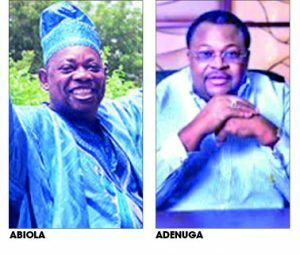 Unlike Abiola, Adenuga will never try politics, says one of his top executives Mike Jituboh: “Talking about his vision, I know and he told me politics is not part of his vision. Politics is out of it. Once, there was this rumour that Adenuga had bought over Abiola’s Concord newspaper and given it to Mike Awoyinfa and Dimgba Igwe to manage. Rumours indeed, but it shows how people love Abiola to the point that they would have loved Adenuga to revive Concord and bring back that powerful newspaper. In this season of the World Cup, it’s worth remembering the two great supporters of African football. Remember the soccer team Abiola Babes? Remember Abiola’s regular sponsorship of the African Footballer of the Year Award? Of course, we remember Adenuga taking over from Abiola with the Glo-CAF Awards, how he bankrolled a foreign coach for the Super Eagles, how he supported the local league, the Super Eagles and their Supporters Club, how he supported the Black Stars of Ghana and their Supporters Club, and how he supported CAF itself. You can go on and on scoring for the two illustrious sons of Africa whose name and giant footprints would forever remain on our shores and on the sands of time. I applaud President Buhari’s Abiola gesture, the Buhari who visited us when my friend, Dimgba Igwe, a staunch member of the International Press Institute (IPI) currently holding in Abuja was killed while jogging on September 6, 2014. I can still see Buhari removing his glasses and wiping his tearful eyes with a handkerchief the day he came visiting. This writer almost all of the time focus on praise singing for men of means.